A Melbourne developer is seeking to expand an upcoming residential tower by building in the 'air' above a neighbouring property. Evolved Developments is hoping to amend already approved plans for an apartment development at 25-27 Coventry Street by expanding the built form so it hangs over an adjoining property. The developer has already purchased the 'air rights' above the adjoining property at 21-23 Coventry Street, Southbank and a subdivision permit to amalgamate the land. 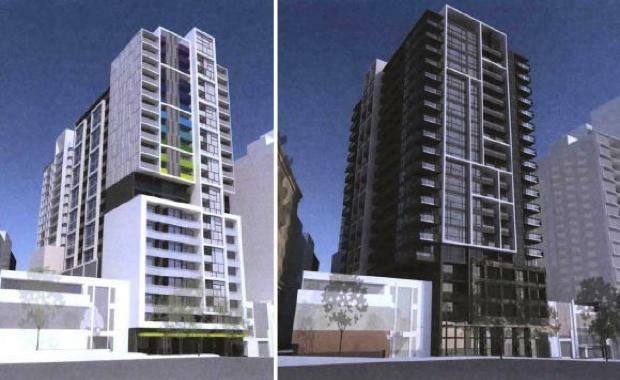 Under the modified plans submitted to VCAT by SJB Architects , the 21-level tower would extend east over the adjoining property from Level 5 upwards. The eastern facade would be altered with the addition of balconies. [urbanRelatedPost][/urbanRelatedPost]There would also be an extra 72 apartments - achieved by increasing the number of studio apartments from 8 to 99 and reducing the number of two bedroom apartments by 20. Overall, there would be 252 apartments (99 studio, 105 one bedroom and 48 two bedroom). The building would also feature a meeting room, library, 279sqm commercial/restaurant space with a 50 person capacity, 177 car parking spaces, 80 bicycle spaces and three-level basement.